However, rather than examine the phenomenon here, permit your cricket-weary columnist (I did caution you I’d be irreverent or unworshipful) to making some passing remarks in the larger social interest. For two particular schools – traditional rivals – arguably the biggest of these ‘big matches’ takes on a carnival atmosphere, annually. This sense of a citywide Saturnalia is not always restricted to a sporting arena. There is something about schoolboy esprit de corps that compels young bloods to congregate around girls’ schools, grocers purveying spiritual sustenance, and the general vicinity of highjinks. Boys will be boys. This year, a departure from the traditional traffic snarls – a departure embarked upon by that bastion of tradition, The School By The Sea – holds out no small measure of hope… for those who maintain that the more things change, the more they remain the same… or that they only undergo a sea-change into something rich and strange. The ritualistic cycle parade – which customarily contains more vehicular modes of transports that are decidedly not bicycles – departed from the hallowed norm by virtue of sporting more eco-friendly machines on two wheels than the traditional three or four or six on souped-up jalopies. Which, while signalling welcome relief to Colombo’s overburdened traffic police as well as its more plebeian motorists prone to grumble at mundane gridlock, also semaphored the potential for transformation that even the most calcified institutions allow. There are seasons in our political almanac when it seems as if nothing significant can be achieved. There is, for instance, the silly season around the time of any poll… Thank the Elections Commissioner that these come around only relatively rarely… It’s a free-for-all in which parties and aspiring electors alike literally go to town… with lies, false promises, and stacks of posters to stick – All at the taxpayers’ expense, to little effective outcome except to perpetuate the illusion of political cultures changing shape and evolving in the national interest. There is an even sillier season – and here I run a real risk of brickbats (or worse, bouquets from café society which break no bones but are useless for critically engaging the art of the possible). It is that period that political analysts might term détente, when it is evident to all but the naïve and sentimental that a war of attrition is on. And the irony is that in a three-sided tussle between UNP, SLFP, and JO, it is the unlikely coalition partners who are most likely to be at loggerheads. There is a panoply of signs and wonders to which we all looked forward, in the early honeymoon’s first-blush wake… Now, however, as the marriage of convenience lengthens its shadows toward the sundown of amity, a showdown of sorts in on the cards. Boys will be beasts. For the two main political parties – traditional rivals – the time for hallelujah choruses about how they jointly kept the Hambantota Hun outside the gate of the House is long past. No longer can cynical spinmeisters and canny propagandists encourage civil society to keep singing hosannas for landmark legislation such as 19A and RTI passed. Or preen one’s feathers in public that the present lot is not in the least like the past sorry lot. The time for pathetic one-upmanship was well and truly over long ago. There is something about singing one’s own praises that is off-putting for the staunchest of stakeholders in the new social contract that is still in the draft stage and no clear road map for the long desired journey towards transitional justice ahead. Amen, and let’s get on to the next items on the agenda? Be the state of play at the biggest and best of big matches as it may, there is little if any doubt that the larger game being played on global stakes is heading for a sorry draw… or at least, an impasse. Brilliant as our foreign minister’s showing at Geneva may be, the ground situation back home leaves much to be desired as Dharisha Bastians’ incisive column this week concludes. Sooner or later – and sooner than later the better – the government must bite the bullet and begin to deliver on the verbal pyrotechnics on display for the admiring consumption of the watching world. 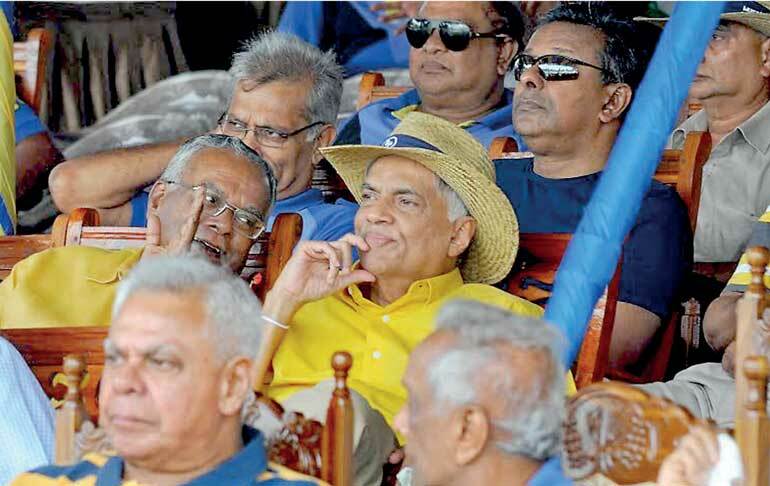 Hope the prime minister – a true blue Royalist – as much as the president – the alumnus of another ‘Royal College’ – would be humble enough to take a lesson from the Thomian cycle parade this year. They have a choice before them… To rally the troops with convincing arguments about the need to deliver on promises made… As much as practically operationalising RTI, OMP, and other instruments towards the effective implementation of transitional justice trajectory-markers on the way forward – Or run the serious risk of losing ground gained over the past two years and more of transforming Sri Lanka from a post-war to a post-conflict society. Both political leaders are astute enough that they cannot each espouse a ‘Be Thou Forever’ attitude, clinging to positions that privilege their sense of power while compromising the national interest. Both have to learn that playing such a high stakes game means running the risk of losing an election for the sake of the economy, our international image, that elusive fruit of peace with justice so many citizens desire to partake of – or depart.